Sorry, a little late with the (gargantuan) list of Alpha-H SPF winners. This will be a little like checking for your exam results, if you remember doing that (I don’t think I bothered turning up to school for mine, I’m pretty sure I just waited for the letter to be posted, but then those years are something of a Wonderbra-clad-short-skirted-Camel-fags-behind-the-bike-shed blur). 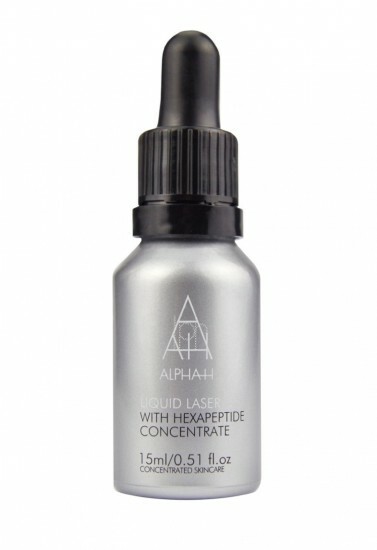 If you’re not a winner, and you do fancy trying something from Alpha-H then there’s a nice little gift-with-purchase running: a 15ml bottle of the amazing Liquid Laser. The launch of Liquid Laser sort of passed me by – I was either heavily pregnant or had just given birth, I can’t remember which. So I didn’t ever really read the blurb properly and thought that Liquid Laser was a more advanced version of Liquid Gold; stronger and with more ingredients. I avoided it, because my skin had been really overly sensitive and I didn’t want to use anything that would rock the beauty boat. Boy was I a) wrong and b) missing a trick! The lightweight, ultra-hydrating Liquid Laser was actually just what my skin had been needing; yes it contains a whole cocktail of AHAs and peptides to brighten and rejuvenate the skin, but it’s a sort of mega-moisture-boosting thirst-quenching face-plumping treatment, not as exfoliation-focused as Liquid Gold. Liquid Laser really works for my post-baby skin which – if left to its own devices – feels taut and dry and papery thin and can often seem dull and tired. Liquid Laser does have a bit of a tingle going on, but nothing that requires you to stand in front of a desk-fan to stop your face from catching fire. (I wish I could remember who told me that their facials that were so acid-heavy that big fans had to be pointed at their face from all directions!) I can’t quite handle supersonic acid peels, these days – though I still try them now and then out of a sense of duty and masochistic curiosity – but I’m perfectly happy with a hint of a tingle. I don’t get any redness or irritation from Liquid Laser whatsoever, which is marvellous considering that it really does seem to do a complete turnaround job on my face overnight. Plump-feeling, brighter skin in the morning – rather like I’ve used one of those sleeping masks, except that the Laser sinks in immediately and doesn’t leave any goo on the pillows. You can of course follow Liquid Laser with a moisturiser – the balm from the same range is brilliant (review coming soon – if you have dry, thin-feeling skin then this is a Godsend) – but I find that it works just as well, if not better, as a standalone night treatment. You can read much more about Liquid Laser at Cult Beauty here – to claim a free 15ml version, you need to spend £50 on any Alpha-H product(s) and use the code AMRALPHAH. (Which I keep reading as AM RALPH AH!) There’s no end date for the code, it’s just while stocks last. Now on with the winners – I’ve sort of bastardised people’s email addresses in some cases because I didn’t have their full names, so keep an eye on your inbox if you suspect you’re one of the lucky fifty. Congratulations people!